We appreciate that there is no “one size fits all” approach to training and knowledge transfer. Depending on the client needs, we may propose a more formal multi-day classroom training that covers a full spectrum of analysis and design techniques, or we may propose just-in-time targeted training to teach only specific techniques at specific points in time. Some clients may not need formal training at all, but prefer hands-on mentoring as the teaching approach. The bottom line is that we are entirely flexible and dedicated to finding the most effective approach that will work for you. Our core curriculum covers the full range of analysis and design techniques. We are able to tailor our courses to reflect your shop’s selected notation (e.g., Martin ERD vs. UML class diagrams), and to reflect the appropriate style, based on whether your software is predominately object-oriented, relational, structured or a mix. (A mix of each is most common.) It is also common for us to customize the course’s examples and exercises to reflect your business subject matter (e.g., banking, wireless, manufacturing, etc…). We believe people learn better when the topic is geared toward their own industry and projects. We also offer additional courses on project management and object-oriented design principles through our strategic partners. An industry expert with over 20 years of experience delivers all of OCG’s training. Training is conducted by either David A. Ruble, OCG senior partner & chief methodologist, and/or Meilir Page-Jones, OCG strategic partner. Both are skilled practitioners and internationally recognized authors as well as entertaining and engaging facilitators. Depending on client preferences, training is typically done at the client’s site and may include lecture, open forum discussion and optionally, a case study for hands-on practice. It is vital to ensure the training is delivered in close proximity to the time when the techniques will actually be used on real projects. If your shop does not have templates for specific portions of the SDLC, we can provide OCG’s standard templates, customize third-party templates provided by your CASE tool vendor, or assist in tailoring documents specifically for you. We can provide period on-site, in-person or off-site review of software engineering deliverables. We assess the completeness, correctness and overall quality improvement of the documents and models. Our review recognizes staff progress and achievement and makes suggestions for additional improvements. We review not only the models, but also the quality and effectiveness of written communications, including organization, sentence structure, clarity and definitions. If appropriate, OCG can provide extended on-site project mentoring to large groups of software engineers. Quite often, learning-by-example is a highly effective tool. By having an OCG expert writing actual specifications on real projects, your staff can more easily follow the examples and better appreciate the appropriate level of detail and rigor that should go into a specification. Reader reviews: "I have read this book three times, and each I learn something new. It is nice to have a book that is independent of any development platform, and in PLAIN ENGLISH to boot. This book is more valuable than the course I had taken in college." 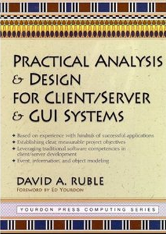 "It's the best book I've ever read about analysis and design techniques for building systems quickly and effectively . . . I've been studying this stuff for years, and Dave has written the clearest explanation of event modeling I've ever read."